The only resources available to the association are the donations it receives and the contributions it collects from its members. To date, all actions are carried out on a voluntary basis; in particular, the development of the Base Camp project. Tipping pays the HelloAsso platform. We use the HelloAsso platform to collect donations, which minimizes our costs. 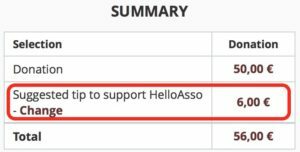 In addition to your donation, you can pay HelloAsso in the form of a tip: one is included by default; you can change its amount or cancel it by clicking on “Change”. Tipping is the only revenue for the intermediary; the integral donation will be transfered to us.